President Barack Obama hosted more than 30 startups at the first-ever White House Demo Day, including a language-learning mobile app, a smart teddy bear named Jerry and a baby monitor that measures vital signs. WASHINGTON — In a typical Demo Day for new companies, teams pitch to prospective investors. But this was not typical. 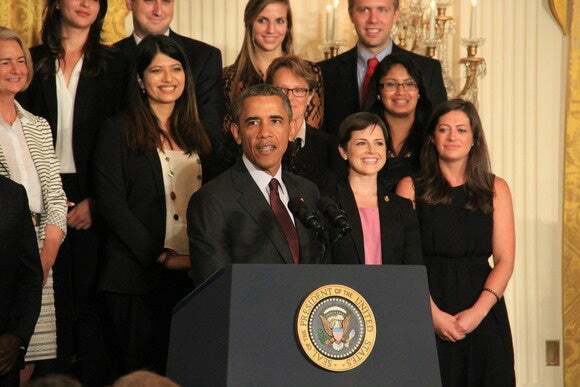 At the White House recently, budding startups had a different opportunity—pitching to the President of the United States. As part of the Startup America initiative to promote entrepreneurial endeavors, President Barack Obama hosted more than 30 startups at the first-ever White House Demo Day, including a language-learning mobile app, a smart teddy bear named Jerry, and a baby monitor that measures vital signs. “If you are going to present to the president, you want it to be perfect,” said Gina Gotthilf of Duolingo, a free language-learning mobile app that was voted Apple’s iPhone App of the Year in 2013. Luis von Ahn, inventor of reCAPTCHAand co-founder of Duolingo, told the president that there are about 1.2 billion people in the world learning foreign languages in order to get a better job or to escape poverty. But traditional methods can be expensive. The app, which is designed to look like a game, capitalizes on the addictive quality of mobile gaming applications to teach users vocabulary, reading, writing and speaking. Obama joked that if he wanted to “spruce up on his Spanish” he would download the app, but he’s “not allowed” to have a smart phone right now. “It was inspiring to see the president interested in improving language education in the United States,” Gotthilf said. At a nearby booth, Jerry the Bear, built by Sproutel, a company founded by Aaron Horowitz and Hannah Chung, offered another smart path to education, teaching kids about general nutrition, exercise, sleep and mindfulness. While conducting interviews of families with members who had Type 1 Diabetes, Horowitz and Chung noticed that the children were using stuffed animals to play doctor, making their own insulin pens and injecting their bears. This led to the first iteration of Jerry, the smart teddy bear that speaks its symptoms, like low blood sugar levels, and uses an LED screen on his belly to display the information. Horowitz said his passion is “mechatronics,” which involves artificial intelligence for robotics and user interaction design. “The next iteration of Jerry will focus on general health and wellness, featuring add-ons for food allergies and asthma,” Horowitz said. This version will be more affordable and is expected to launch in early September. The Cocoon Cam app running on a laptop, where you can watch a camera trained on the baby's crib, for instance. Cocoon Cam co-founder Siva Nattamai had a different concern when his baby was born. Nattami and his wife experienced stress when their infant was sleeping because they had no way of knowing if she was OK. But a new intelligent video monitor allowed them to do just that. It was the brainchild of Rubi Sanchez, the founder and CEO of Wearless Tech, Inc., and CTO Pavan Kumar, who co-developed the patent-pending solution to Nattamai’s problem using computer vision and cloud-based data analytics. “There are a lot of wearables that are trying to break into the industry, but we’ve found that parents aren’t comfortable putting something on their baby,” Sanchez said. This monitor uses a digital video camera and non-invasive infrared technology to track the baby’s heart rate, respiration and skin temperature from a distance. Then, parents can stream video and wellness information straight to their phones. In an interview after the event, Sanchez said the next step for Cocoon Cam is obtaining FDA approval, which would allow the company to use its data to contribute to research on the health of newborn babies.